A hilarious high-energy musical whodunit, Murder For Two is a madcap murder mystery with a twist – two actors play thirteen characters, and the piano. A loving homage to the canon of murder mystery plays, Murder For Two is a hysterical blend of music, mayhem and murder. Following its sell-out European Premiere at The Watermill Theatre and The Other Palace in 2017, Murder For Two is back at the Other Palace for a limited 5-week run this December. 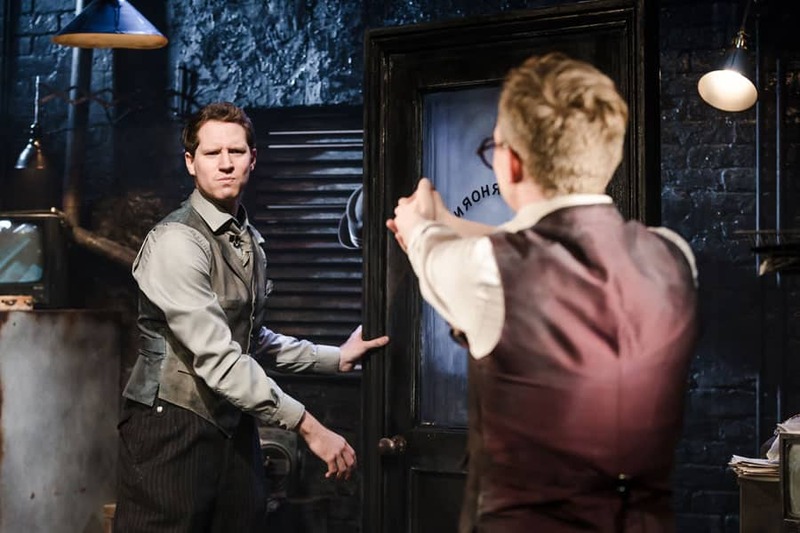 We talk to actors Ed MacArthur and Jeremy Legat – who reprise their performances as ‘Officer Marcus Moscowicz’ and ‘The Suspects’ – about the challenges of performing a two-hander murder mystery musical. Murder For Two isn’t a typical musical. Can you tell us a little about the premise? The show was a huge hit Off-Broadway. What do you think makes it so popular with audiences? ED: “Everyone loves a whodunnit! And on top of that, Joe Kinosian and Kellen Blair have written a show packed with fantastic songs and relentlessly silly gags”. JEREMY: “It takes no prisoners. 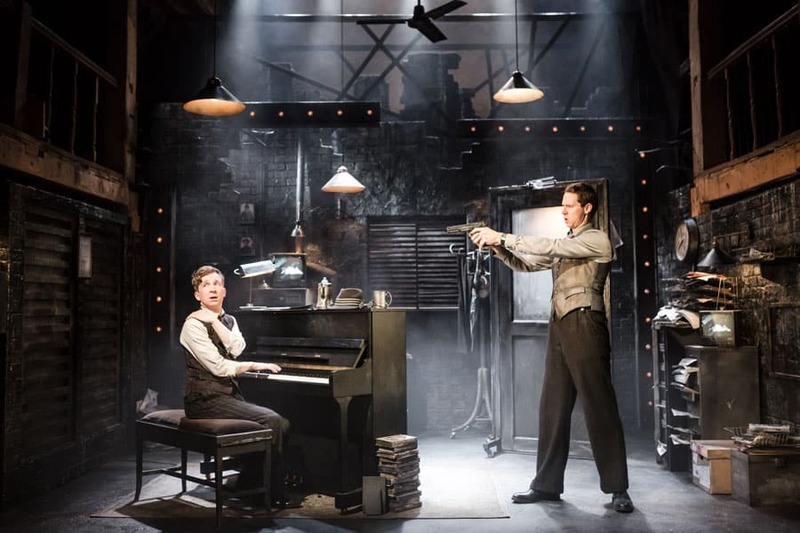 Murder For Two is quite brilliantly bonkers from the moment it starts, yet it’s also smart, the songs are terrific and as the title suggests, there is a murder to solve too! 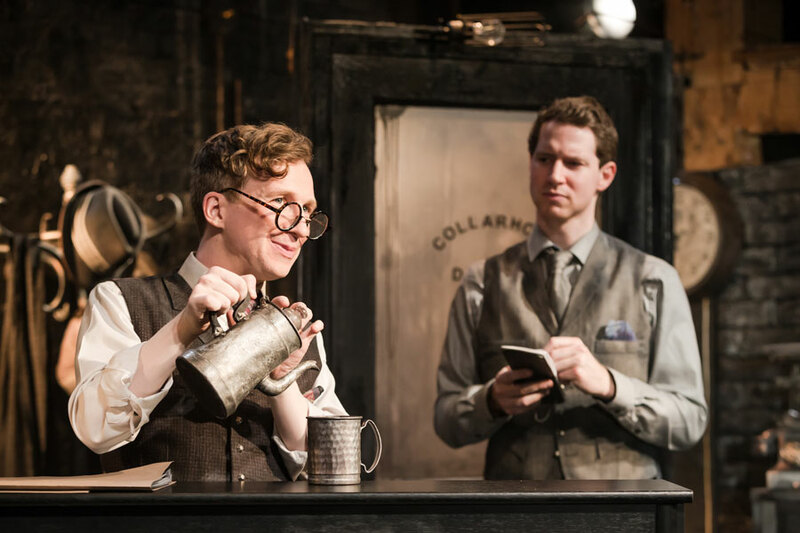 The characters are so well drawn, that I think audiences can’t help but be involved and intrigued by them and they certainly laugh their socks off at them too. Audiences love to laugh, and Murder For Two delivers this is in spades”. Jeremy, you play twelve characters in 90-minutes. This must be one of the biggest acting challenges you have faced in your career? JEREMY: “Playing twelve characters is, hands down, the biggest acting challenge of my career to date. I come off stage feeling like I’ve gone ten rounds in a boxing ring. At times some of these characters have conversations with themselves. There’s one song where I play both halves of a rowing married couple, whilst accompanying them on the piano! And all this while swapping hats, glasses and accents. I shall need a lovely, long sit down after this tour”. How did you go about creating each character and ensuring they were all distinct from each other? JEREMY: “Luke (director) and I started with a photo mood board for each character, to try and capture the look, essence and physicality for each character. I can’t say I’ve ever had to channel Miss Piggy, Bryan Cranston, Audrey Hepburn and Alf from Home and Away all for the same performance before. Signature props and costumes, and also gestures or stances were then created and we went from there. As you’ll see, there are moments in the show where I have to change character on a dime, so a clear, sharp gesture is needed quickly to tell the audience who I am. Luke was a stickler for telling me when I was being too general and when I was being specific. All of this was very useful”. Do you have a favourite character to play? JEREMY: “Oh lawks, this is when actors tell you that you’re asking them to choose a favourite child isn’t it? We spend a lot of time with Dahlia, the victim’s widow, during the course of the show, so understandably I grew very fond of her and probably will again. But then there’s the three potty-mouthed children who are cheeky and rude and whose song gets such a great reaction each night. Then there’s the strange, elusive ballet dancer. All these characters are nothing like me, so it’s delicious to play each and every one of them”. Ed, as well as playing Officer Moscowicz you also provide musical accompaniment, playing piano live on stage. Is it a challenge using these different parts of your brain simultaneously? ED: “Hugely challenging – we’re very excited to be bringing the show back, but we’re also absolutely terrified! The singing and playing all happens at break-neck speed, so we need to get our brains back in gear. I find it hard enough playing one character – I don’t know how Jeremy’s brain copes with the multi-rolling and playing. I wonder if he takes cod liver oil supplements. I’ll ask him. If he says he doesn’t, I’ll ask him what the smell is onstage”. What is it like performing an entire musical with just one other actor? You must have a great rapport onstage and off? ED: “It takes a huge amount of trust! So I feel incredibly lucky to be working with such an impossibly talented, funny and generous actor in Jeremy. I have the best seat in the house for his performance and he’s a hoot on and offstage. And yes, I’m contractually obliged to say all of the above as stipulated in his rider”. JEREMY: “It’s a real bonding experience doing a two-hander, as we only have our two brains to rely on once we’re out there. The queue for the kettle at tea break is short with only two of you around, so that’s good too. I adore the guy and I love working with him. He makes me howl with laughter and he’s very talented. Without giving anything away, do you have a favourite moment in the show? ED: “We used to be terrified of making mistakes – now they’re my favourite moments, and they’re both unavoidable and different every night. It’s such a fast-paced show that it’s impossible to maintain a perfect performance – there’s always a blunder where we play the wrong note, line or even character, and I love those moments the most”. 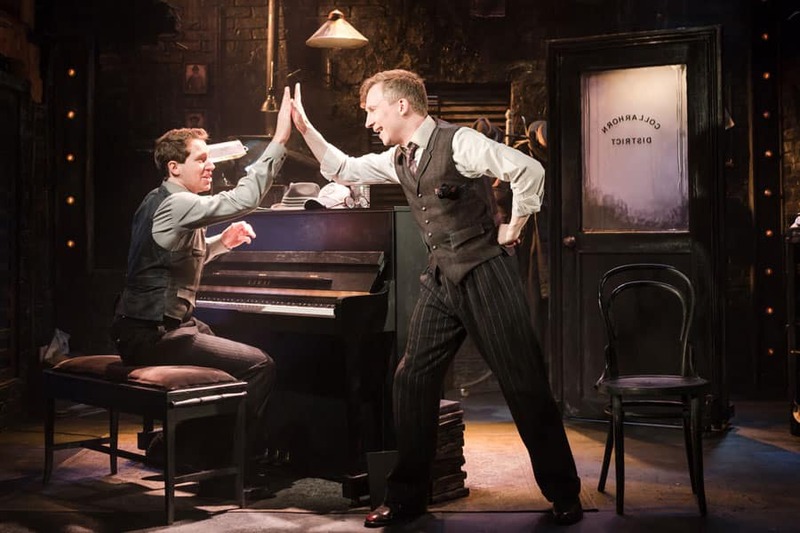 JEREMY: “As Ed said, it’s the bits we can’t plan for – when something goes awry, whether it be a dud line or a dud note on the piano, or when I forget which character I am – it has happened – and then how the audience responds. You have my solemn word that we don’t set out to engineer a gaff or a blooper – it wouldn’t be funny if we did – but when they do crop up, they are delightful to deal with”. Murder For Two is very different to most new musicals on offer. Why should people come and see it? ED: “Because we all lead very hard lives! And this show is a vehicle for us massively showing off in an effort to entertain the audience. Come to the show, buy yourself a drink and forget the world for 80 minutes with some gloriously daft musical comedy”. JEREMY: “As we look around us at the moment, there really doesn’t seem to be much to make us laugh. That’s why Murder For Two is the perfect antidote. It doesn’t matter if you’re male or female, young or old, right wing or left wing, a squirrel or a blue-footed booby… Murder For Two will hit you square in the funny bone, and tickle you silly for two solid hours. That is a promise”. Murder For Two is at The Other Palace from 12 December – 13 January.